When I thought I could not go on because my body was under attack from cancer.. 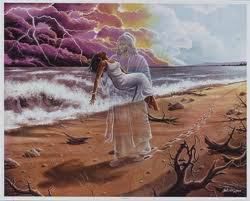 He carried me. Never before had I felt such peace within my soul. Others saw it as courage ,but they did not know I was held in his grace. Kept safe from those who turned their backs while I recovered and lead to those who would be my future. I had let go of all my worry about myself and allowed my faith to be my coat. From those who I had been of service to in the past came the assistance I needed to move forward. He carried me. I have received all my blessings and much more from believing! Your blessings are coming to you when you believe!